"Professor, where is your star?" "You can't see it from here. It is too far." Work on this film began in 2004. After premiering on February 12 in Star City in Russia, "Alice's Birthday" went into "wide" release on February 19 ("wide" because 200 theatres is very little, even in Russia). So how did it do? Mixed. The box-office results were very poor. The small number of theatres, lack of almost any afternoon screenings, ineffective advertising and perhaps the unusual graphical style (which is deliberately neither Disney nor anime) contributed to a terrible debut in 9th place with $130,000, $650/theatre and 66,700 viewers (source). This is not nearly enough to cover the film's 60 million-ruble budget ($1.5 million US by current exchange rates, $2.5 million by the average exchange rates from the past two years). It probably didn't help that the buzz leading up to its release was very negative because people were outraged that the classic characters from The Mystery of the Third Planet were being given a makeover (never mind that the film was never meant to be a direct sequel). Russian journalists wrote things such as "look at this clip, and see for yourself - never has any Russian children's cartoon been drawn so poorly." Upon the release of the film, the consensus of professional Russian reviewers hasn't changed; they don't like the film and critique just about everything about it (though most admit that the voice-acting is great). But a funny thing - on animation forums such as prodisney.ru and Russian IMDB-like sites such as Afisha, KinoAfisha and KinoPoisk, most reviews are positive and the average ratings go from 6.3-7.7/10. I've read comments from some very skeptical people who expected little and ended up being pleasantly surprised. pilot-pirks' review sums it up nicely. Also, journalists who describe the reactions of children say that they loved the film. The reaction from Western journalists has been much more positive. Also, the film has been selected to be screened at the 35th Seattle International Film Festival. So I don't know what to think right now. I must say that personally, I've mostly liked what I've seen since I first heard of the project. But I'll give my thoughts once I've seen the film. Until then, here's an interesting Feb. 18 interview with the creators of the film from Proficinima.ru, translated by myself. Subjects covered include artistic challenges and the commercial situation in Russia. Sergei Seryogin, Alexander Gerasimov: "We have created a space thriller in which not a single shot is fired"
On February 19, the animated film "Alice's Birthday", based on a story by Kir Bulychyov, will be released onto Russian cinemas. Meeting with director Sergei Seryogin and producer Alexander Gerasimov, we find out about all the features of this project, the process of its creation and advancement. «The Adventures of Alice» is a fairly well-promoted brand. What interested you more: finding a new approach to the story which more than one generation grew up with, or making a commercially-successful project? It is true that Alice is a brand. But it is hard to call the story itself well-promoted, because Kir Bulychyov wrote quite a lot of adventures with Alice Seleznyova, and we tried to take a story which had not yet been adapted to film. In truth, there were not so many adaptations: «The Mystery of the Third Planet», «Guests from the Future», «Two Tickets to India» and «Lilac Ball». Only the first two of these were successful. We absolutely understood that Alice exists both as a literary brand and as a film brand; and that this would, on the one hand, help, and on the other hand, would create many complications. That is basically what happened. How would it help? There would be no need to explain to people what our film is about. Everyone instantly understands what is Alice Seleznyova. And that's where the help ended. The rub is in the fact that everyone has their own Alice - there were two remarkable film projects, as well as Migunov's book illustrations. We did not want to repeat either the visual, or the stylistic trappings of any of these. Because of this, all that we make is automatically compared to what was done before. We were aware of this from the very first day that we took up the project. We walked into it deliberately, to some degree because of our eagerness to match strengths against our predecessors. For me, it was very important for us to create rules of perception in this movie which would be logical and relevant. For our Alice to suit the world which we have drawn around her. If all the traits of this heroine are justified, and the story is interestingly told, probably the public will accept this Alice also. But that does not mean that she is ideal. She is merely the Alice that we see. Basically, everything that you say is a problem of any screen adaptation, is it not? There are two sides to the problem of the screen adaptation. Yes, there is a literary source, to which we owe a certain faithfulness. But today, in general, there are big problems with original stories. Basically, what is being made now are adaptations or parodies of well-known literary subjects. You can call this script famine or a famine of ideas - I cannot think of anything that I have recently read which I have truly liked. Even though a lot of screenplays are sent to our studio. None of them turn out to be very interesting. And so we adapted a time-tested story. «Alice's Birthday» is one of the earliest stories from this famous series. But making movies, you can not blindly follow the original. If we did, the movie would have been over in thirty minutes. Therefore, we started thinking up new things. We began to place additional obstacles in Alice's path, and watch how she wriggles out of them. New characters and new situations appeared. While writing the script (Andrei Zhitkov, Andrei Salomatov and I worked on it) and the storyboard, I was very concerned about the reaction of the readers of the original story. Two things helped. I suddenly found an interview with Kir Bulychyov, which he gave shortly before his death, where he was asked about his attitude to screen adaptations; about filmmakers changing things in his works. He told of how he had once sat at the premiere of a film; an adaptation of one of his stories; where everything was exactly as written in the book. He sat and wished impatiently for it to end, because watching the film was unbearably boring. And there were also instances where the script was very much redone, and it was good. After reading this, I realized that everything is fine - I have received a blessed correspondence. Then, before the film was yet completed, while it was still being edited and coloured, we showed it to Chelyabinsk resident Mikhail Manakov; the main bibliographer of Kir Bulychyov, the main custodian of its heritage. He told us that a very Bulychyovesque movie turned out, almost exactly like the book. Never mind that in certain places we changed some things - the spirit was reproduced exactly. So I think that we did overcome this barrier after all. As far as I know, this project was, throughout its whole production period, open to scrutiny by its future audience. The design of the characters was actively discussed online. What was the purpose of this? Usually when a film is made, it is hidden under a veil of secrets. Its creators make sure that none of the crew blab about the "what" and the "how". We did, indeed, from the very beginning post all of our designs on a fan site for «Guests from the Future». They caused a commotion. A lot of criticism came my way. In addition, some material that was edited together - still not a finished film - was shown to a fairly wide audience a year ago at the fantasy festival «Eurocon». Bulychyov stood at the origins of the first convention; he was one the pioneers of this event. This project has been open from the outset; we read and listened with interest to what people thought about it. On the one hand, it was a PR move; on the other hand, it was consistent with my long-held belief that it was necessary to make a site that would function as a sort of diary of the film, whose visitors would feel themselves to be co-authors. After discussions about the sketches, changes were made to the appearance of at least one of the main characters. The arguments of our opponents were so convincing that I said to our artist Sergei Gavrilov, that I had nothing to add to them - Professor Rrr can not stay the way we drew him. He agreed, and something changed thanks solely to the online audience. It also served as a source of ideas for us. After all, we do not yet have an artistic school in our country for animated feature films. There was a big break between the era when Soyuzmultfilm was making, not many, but some films of this sort. That which has begun appearing now is to a large extent the isolated work of Melnitsa Animation Studio. We started working on this as amateurs. We had a certain number of short films made in our studio «Master Film», but a feature film follows completely different rules. There must be a different approach to the material. Feedback has been an education for me. How attentively were you prepared to listen to online opinion? What kind of arguments might have provoked you into changing something? The arguments had to resonate with me. We did not seek to please anyone. Maybe, in the context of a commercial super-project, this was a mistake. The task before us was to make animation that was Russian (not imitating Disney's style); to orient on our own school. It is, in any case, impossible for us to out-Disney Disney. They have a different way of thinking, and their animation originally developed in a different way; it was guided by comics and caricature. Our animation developed with a focus on folklore and book illustrations. Any changes that took place did so in keeping with this idea. Which domestic films guided your work? I would not say that we were guided by any films. We did not search for our style in cinema. In «Alice's Birthday», there are three worlds: the future of Moscow, the dead planet Koleida and the Koleida of the past, to which the heroine travels to rescue it. This past parallels the Earth in the 1950s-1960s. We and our art director immediately determined this, went to the library, and compiled many different magazines of the time. Much was taken from there: objects, interiors, landscapes, fashion, architecture. There are even some things that were literally redrawn from adverts in foreign magazines from the1950s-1960s. The style of our movie can probably be characterized as slightly retro. We tried to absorb all the best that was done by Soviet animation in its finest years. It sounds sentimental, of course, but it's true. We have a very good art director. We initially doubted Sergei Gavrilov; his first designs were somewhat peculiar and bold. Then he got into the groove of things, and we realized that the guy has his own style; an interesting, very original style. Our visual look was guided by his hand. Did you have a desire to create some recognizable trademark in the look of the characters? For example, as in Japanese anime, Disney cartoons, or as in the recent «Fedot the Hunter». There were no such particular goals. Sergei Gavrilov did at one time propose creating a sort of decorative trademark. He had the idea of doing everything with a red contour. But we thought that we probably couldn't allow ourselves to take such risks with our project. We also thought about the audience, because watching red outlines for an hour and a half would be, to put it mildly, difficult. Most of all, we thought that it must look like old children's book illustrations. What special effects were used in the creation of the animated film? Why was it decided not to use 3D animation? Originally, the idea was to find a balance between traditional animation and 3D, which would allow having a more-or-less free camera that could wander between the three-dimensional decorations. But it became clear that this would be time-consuming, expensive, and go over-budget, with no guarantee that the picture would turn out to be any good . In «Alice», there are some 3D-ish characters, but it was used more as a support element. We did not rely on them. What we had wanted to do accomplish with a mobile camera, we tried to replace with competent editing. We decided to use other "hooks", ones that were more intelligent and would require more work: Good pacing and a strong, tight story. This is in itself an art requiring talent. We therefore worked on the script for a very long time: we honed every line and invited a literary editor. The grinding of the script lasted more than a year. I should also say that the film turned into a musical, although I myself did not expect this. There are five songs in there. They vary in mood: parody, lyrical, and simply children's. We worked with Dmitriy Rybnikov, the son of Aleksey Lvovich Rybnikov. We began our work with the senior composer, but at some point he offered us two melodies written by Dmitriy. We worked together very well. And Aleksey Lvovich stayed with us as a music producer. He has a tremendous professional flair. Why was it decided to shoot precisely a feature film? Was the decision affected by the fact that a feature film is much easier to show to the public, or something else? Yes, primarily because of the ease of circulation. When filming on "Alice's Birthday" began, our studio had already existed for ten years, and during that time an enormous number of animated films were made, ranging in length from 1-24 minutes. They all just sat there like dead weight. We made a DVD-collection which sold a certain number of copies, but rather weakly. These days, if we want our production to reach not only the professional community but also the viewer, the format must either be that of a feature film, or that of a TV series, if it is made for television. But with television, lately, things are not that clear. And so the feature film format is left, which can be shown in cinemas. Indeed, throughout the world, as Sergey said, there are two commercial formats: either feature film, or TV series. With the latter, there is a problem in our country, because our channels are not yet able to order animated series. Before the crisis, they were just-just starting to approach the matter of paying attention to animation; some preliminary negotiations were already under way; even the budgets and huge production periods were no longer scary for them. But then came the [economic] crisis. The situation with feature films is better. There are 1800 cinemas in our country. There is a hope that, with a responsible production budget, a film could give a return on its investment, while being released only in Russia. This is possible if it is made inexpensively, expertly and is then successfully released. And then there is the second release: television, DVD, and the fast-developing but still unclear online market. Plus possible merchandising. We have decided to go the full distance on that. And yet, distributing the film turned out to be quite problematic. Despite the fact that you can count on the fingers of one hand the amount of such films that are made in our country, foreign competition is very tough. Hollywood has not stopped working, and neither have Europe or Japan. The flow of foreign animation is such that it is very difficult to pick a release date for the film that would allow it to have the field to itself. We thought that we selected a good choice for "Alice" - we specifically did not release it during the New Year holidays, because just then "Fedot the Hunter" and three blockbusters were being released, so it was useless to hope for success. We picked February 19 - this is a good date because there are soon holidays on February 23 and March 8, and because schools which operate on a three-term schedule begin their holidays. Now it turns out that, I believe, twelve releases are announced for this day. Among them are a few direct competitors. The situation is difficult, and we hope that we have the pillow of Kir Bulychyov to fall back on, that our promotion campaign is good and that it will do well. We had practically no advertising budget. And we learned a lot about how to extricate ourselves from such an unenviable situation. With a minimal amount of money, we managed to come up with many interesting things - not expensive, but effective. With this, we decided to prove, to ourselves primarily, that brains and good planning, not money, decide everything. An example of this is the idea of a press-screening in Star City. Mostly, advertising for «Alice» was done with cross-promotion. In addition, we are engaged in merchandising: a book with illustrations from the film, coloring books and puzzles will be released. 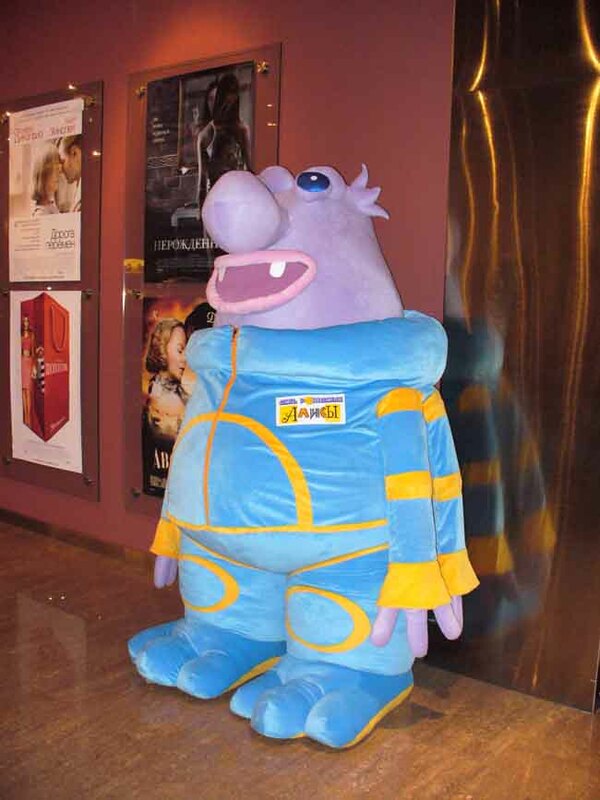 Instead of cardboard stands in cinemas, it was decided to create a large plush toy of Gromozeka. Although, unfortunately, feature-length animation is not a basis for mass merchandising in Russia. We are told that if it was a trilogy (three films, one a year), with a TV series released in between, then there would be sense in starting things up. How is your relationship with movie theaters? Were they willing to take the film? We have a distributor named «Panorama kino». It is a small company, but we are satisfied because they are now working only on "Alice", and also because Andrei Ivanov already has experience with distributing children's films. They were the distributors of "Elka" and "Granny Yozhka". What's surprising is that some theatre chains (distribution begins with theatre chains; if you get in there, everyone else follows) refuse to take "Alice" at all.«Kinostar Deluxe», for example. Our distributor tried to negotiate with them for several months, but they simply refused. One man, roughly speaking, decides whether half of Moscow will see a film or not. It is unknown what the selection criteria are. In our country, ten people decide whether Russia will see a film or not. Practically no-one can influence them. There are no councils or expert commissions. In the end, after all, one could allocate screenings within the cinemas of a particular chain. "Formula Cinema", which isn't showing "Alice", has 65 theatres - why not show the movie in at least some of them? In this situation, I understand those who advocate the introduction of quotas for Russian productions. If the picture is good and filmed in part with public money, it must be shown in cinemas. There is a need for protectionist measures to protect our population from foreign films of low quality, of which there are, unfortunately, a lot on our screens. Here we worked on «Alice» for an entire three and a half years - a space thriller in which not a single shot is fired! How much toil was invested! In result, we made an interesting, modern and dynamic film, which both children and adults will watch with pleasure - I say this quite honestly. Yet the greater part of our population will not see it simply because it is not playing in a nearby movie theater or shopping mall, and few would go to another district for this. But mostly, theatres are showing «Alice»; only three chains have refused so far. We have already printed out 200 copies, and we will probably premiere with 250. "Russian journalists wrote things such as "look at this clip, and see for yourself - never has any Russian children's cartoon been drawn so poorly." it could be one of the best animated movies to be made after the fall ot the USSR. It has depths, a certain research, a good contact with fans and audience. a labour of love, Englishmen would say.